Another day, another football match. Whilst I can’t have a conversation with Dan without a 20 second delay, I thought I would share my next holiday outfit with you. I’ve mentioned on here before that I went a little crazy before my holiday, buying things with the excuse that I 'needed it for holiday'. When I was away I realised how crazy I had been; I think I wore about half the things I took and many things still have the tags on (whoops), needless to say I'll be taking a few things back this weekend. There is one impulse purchase that I really don’t regret and that’s this really pretty Boohoo dress that I ordered a few days before going away for an evening option. 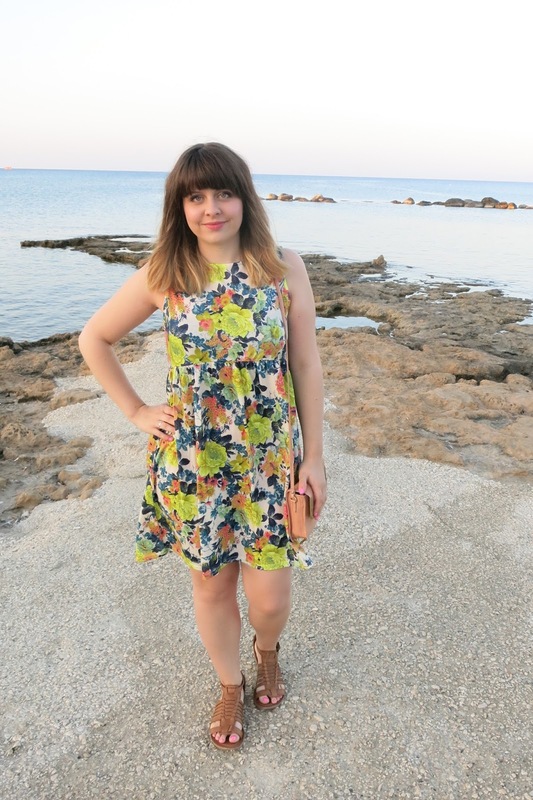 You can never go wrong with a pretty floral smock dress. I really love this as it was so reasonable but it’s such a pretty and unique design. I teamed it with this year’s sandal addition; I like the contrast of the green and tan. Oh how I would love to be on a seafront right now. You could say I’m suffering from post-holiday blues just a bit right now (as I sit here with puffy eyes and a sniffly nose- thank you so much hay fever)! The weather has been its true unpredictable self this week but I’m hoping the weather stays away this weekend so I can imagine I’m back in paradise! Definitely perfect for holiday! We always have reasons to buy nice things, lol! Love this little dress! You look gorgeous & really healthy, your skin is glowing!